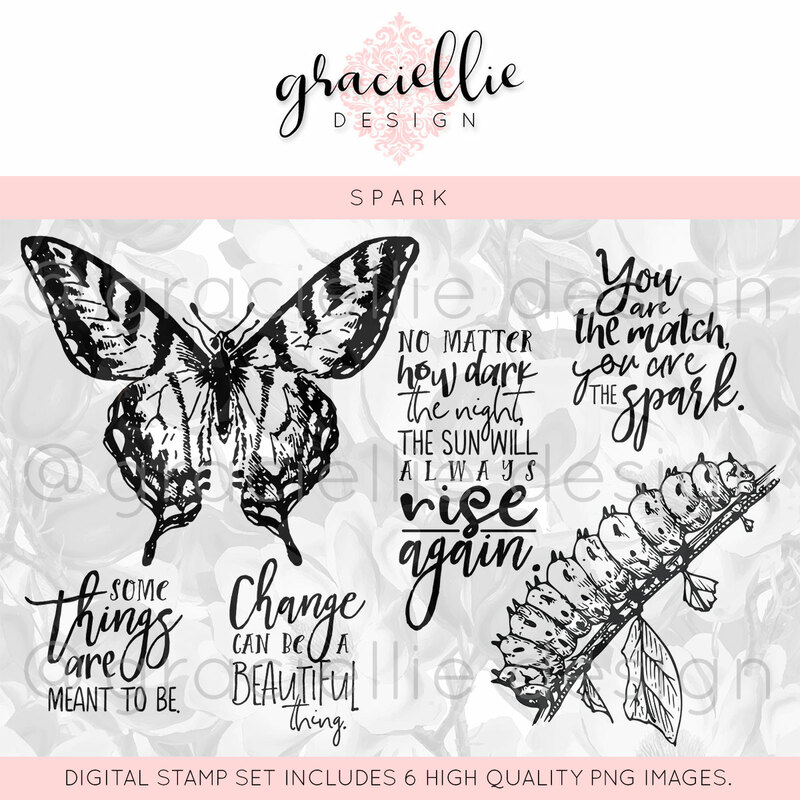 Graciellie Design is having a flash release and sale for World Card Making Day. Be sure to visit her Etsy shop and enjoy 40% off regularly priced digital stamp sets. Here's a fun tag I created for today using her digital set -- Spark. I know you usually think "spring" when using caterpillars and butterflies, but I feel like I succeeded in making an "autumn flavored" tag by using earth tones. At any rate, I love the sentiments in this set --- they're good for any time of year! Lovely tag - like the vintage style. Great take with our "Stencil" Challenge this week over @ Little Red Wagon. Thanks for joining us and i hope to see you back again soon. Love your autumnal tag. The colours are lovely along with the embellishments. Thankyou for coming and spinning the butterfly wheel with me this week. Hugs Mrs A. Very pretty, the vintage look and warm colors are really beautiful. I love the sentiment, too. Thank you for joining Simon Says Stamp Monday Challenge. Beautiful, I just love the way you have layered all of this and you have given it a wonderful Autumn feel! Esther, this is stunning! I love every single thing about this (and then some, lol). Thanks for the inspiration, and yeah... I NEED that set!!! lol Thanks for playing with us at 4 Crafty Chicks, hope to see you again. Gorgeous, fabulous tag, Esther! Glad you played with us this week at 4 Crafty Chicks!